When my granddaughter was born at 24 weeks gestation earlier this year I found myself later that day staring into a NICU incubator with the very somber realization that across America thousands just like her are never given the chance. Phil Keaggy wrote a song a few years back that asked, "Who will speak out for the little ones?". For that reason alone I could never allow myself to vote for a candidate who supports abortive rights. Life is sacred, and the lives of the innocent have to be defended, not discarded. Fortunately we still have choices in this country. For how long, I'm unsure. My daughter in law's doctors advised she abort to save her own life. But what if the government via socialized medicine and not private insurance was paying for the costs? Would she have had the choice? Makes you wonder where we may be headed. A friend in Florida attended a political rally recently and this was one of the pictures she took. I have some basic, fundamental problems with that sentiment. 1. Jesus (the real Messiah) said the world would know we are His disciples because we love one another. 2. Unless I divulge the information, how I vote is known only to me and God. So, how will the world identify me as a Christian by my vote? Instead, the world may choose to identify me as a racist or a homophobe or a war-monger if my vote is my “witness”. But love for other believers? That’s a witness that can’t be confused. 3. It assumes that genuine Christians have only one choice in the election. 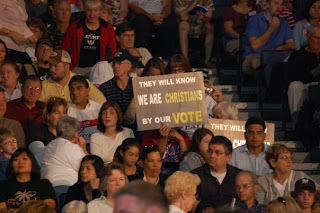 And with that assumption is the implication that if I don’t vote that way, I must not be a Christian. Yet, quoting Jesus again (He is the Founder of the movement, and therefore has the authority to define the terms), Christians are born into God’s family by believing that God sent His one and only Son to be their Savior. That simply means that Christianity is not procured nor is it maintained at the ballot box. There’s a lady here locally who gets revved up every four years and goes on her own personal email campaign to ensure that everyone else understands the issues and where God stands on them. Somehow I’m on her list, although I’ve blocked her on one of my email accounts. It’s not because I prefer to be ignorant of the issues, however. It’s because I see people placing their hope in men and women, not in the eternal Sovereign God. Bottom line is this: As one of His children I’ll answer to God for my vote. It is my responsibility to both know the issues and whether or not God has given clarity on His position by studying His Word. I believe He has given clear doctrine on such things as life, mercy, justice and our role as stewards of the planet we call home. Should my faith influence my vote? Absolutely. How can it not? Is my faith proclaimed to the world by my vote? The world that needs to know the salvation offered by God isn’t going to find it by how I vote. What will attract men and women to Christ is how we love one another. By all means, vote! And base your choice on principles not party. But the genuineness of the Christian culture will be shown in the days ahead by how we love each other. And my hunch is that the opportunities are going to be increased. Today's message was about our first purpose in life: worshipping the God who created and loves us. A couple videos today: one I got from bluefishtv.com taking a humorous look at worship to make us think about our own experience; the other a new commercial for Trunk or Treat that Nathan produced. Good job Sue and Elvis. You can see the video on Youtube. The songs selected today went perfectly with the theme. Singing the "Revelation Song" after I read from Rev. 4 and 5 helped bring it into focus. During the offering we went without music and I asked everyone to use the 2-3 minutes to just worship God, expressing to Him why He is worthy. I think some had a hard time keeping focused, which happened to be the next point of the message. In between gatherings I hung out alone on the balcony - a terribly neglected but fantastic place to chill. Up there I just sipped my coffee and listened to the roar of the folks below in the lobby enjoying some fellowship. That's so cool. There was a huge difference between the two "congregations" today. High energy at 9:00. Very reserved at 11. It's kind of strange, and makes you wonder why. But I think (that's the best I can do) that the 11:00 gathering tends to attract those who by tradition go to church at 11. Those at 9 are a bit more out of the box. Just a guess. It will be interesting on Nov. 9 when we just have one gathering due to the OBX Marathon. A very kind guest has written a blog post about his annual worship experiences with us. Hearing objective stuff is encouraging, and he shares about his own church, too. Thanks for your continued prayers for Tricia. She goes back to Duke for another biopsy on Tuesday. This morning while I was ironing a pair of pants to wear to church (which my wife vetoed) I turned on a news channel. There were two veteran newsMEN debating over Sarah Palin's wardrobe. No kidding. And it wasn't HGTV. I think that with the plethora of 24 hour news outlets they just must be running out of newsworthy topics. Or maybe America really cares where she bought her clothes? If we do, we're in deeper trouble than I thought. As your mom told you growing up, "You're the prettiest girl in Portsmouth, Norfolk, Newport News and Nags Head!" Still are! Enjoy your special day. Looking forward to dinner out tonight. Tweedle Dee and Tweedle Dum aren't our only choices. 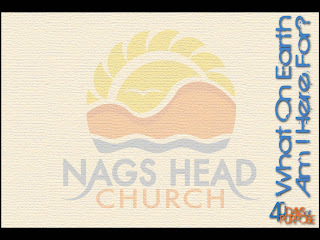 The link is also maintained on the right of this page under "Nags Head Church sites". You can "subscribe" to the podcasts, letting you know when a new one is added. And Nate tells me they will be up on itunes in a few days (whatever that means). So if I vote early or by absentee ballot and then I die before election day, how is it that my vote should be counted? I'm dead on the day of the election? Is it right for dead people to vote? And you gotta figure that this happens to literally thousands of Americans. Alive on October 4 but dead a month later. Why even have an election day? Let's just have an election year, then add up the totals on Dec. 31. That makes just as much sense as letting dead people's votes count on Nov. 4. Just wondering. But what difference would it be if on election day I went and cast a vote for someone who had died six weeks earlier and in a sworn affadavit said, "Here's how I will vote on Nov. 4." Would that vote be allowed? No way. He's dead and can't vote. But if he had voted early his vote counts? Go figure. But the biggest laugh to me is that I can walk into my local polling place, give the folks there a name with a corresponding correct address and without checking any ID they hand me a ballot and allow me to vote. Yet without ID a young adult can't buy a pack of cigarettes. Go figure. "What on earth am I here for?" There's a question that's been asked in every generation by every culture. So this morning as we kicked off 40 Days of Purpose we took a look at what the Bible says. The Big Idea? If you're going to know your purpose in life you have to start with God. He's the Creator of life and had you and I figured out before the foundations of the earth were formed. The songs chosen by Nate today all related super well with the message, pointing us to our Creator and Savior as the givers of life. No more donuts! Our source for Krispy Kreme no longer carries them, so today there were bagels, brownies and sweet potato biscuits. No one looked hungry! In between gatherings I went up to the balcony (a terrible ignored hang out in our lobby btw) and relaxed for a few minutes. Then I stood and looked over the wall, watching folks coming in and those already in interacting. This is how church should be! Pretty good response today with our memory verse for the week! Next week will even be better. The fall settles us down into pretty much a home town crowd at church. And that's not really a bad thing. Now locals outnumber the out of town guests and we resemble more of a normal church congregation. Well, I don't know if we'll ever quite be normal. Big week ahead with the Chowan Baptist Association holding their annual meeting at NHC. This association goes back to something like 1806 or something. Most of the originals are dead, however. 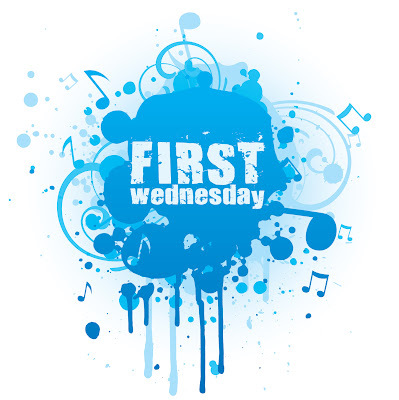 Then Wednesday night is our once a quarter CREST gathering at church, where we get the opportunity to hear from our various ministries what God is doing in the church and through the church in the community. After an early afternoon defeat of the dallas cowboys I'm settling in to watching the Washington Redskins hopefull resume their winning ways today. Then tonight, the final ALCS game will decide who goes against the Phillies in the World Series. Next Sunday: The purpose of worship. Hide your hard earned dollars somewhere. Barack Obama told a tax-burdened plumber over the weekend that his economic philosophy is to "spread the wealth around". Spread whose wealth? That's my question, sir. Republican presidential nominee John McCain argued on Wednesday the U.S. government should take up his $300 billion plan to buy troubled mortgages in order to put an end to a protracted housing crisis. And from where will Uncle Sam get that 300 billion? You get 3 guesses and the first two don't count. It sounds to me like whichever one wins, a revisionist Robin Hood is coming to Washington. Our pockets are about to be picked by the Merry Men (and women) of Capitol Hill. You and I who have worked hard for whatever "wealth" we have are getting ready to part with more of it. Or do the candidates have another way for the Fed to come up with funds? If so, please share it with us. Do you have those days when you just want to get in the car (or for me, truck) and take a long drive away from it all? They come often if and when you deal with people. Don't misread me. I'm a "people", too. And not the easiest in the world to deal with. But somedays you gotta wonder, "OK God. What's the deal. Do I really deserve this?" You know, someone did something you didn't like. Someone forgot to follow through. Someone looked at you cross-eyed. There's an elephant sitting in the room. Whatever. But none of it really is stop the world and get off stuff. In fact, I don't think I've ever had one of those. Then I stop and consider what others are dealing with; things that truly would not only rock my boat but likely capsize it. And it's then I'm a bit ashamed of my little pity parties. I just talked with Nathan. Tricia's PET scan showed no remission in the cancer and that it may have spread to a lymph node in her chest. 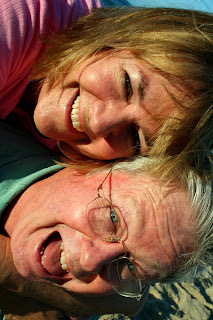 Tomorrow they will do a biopsy and from there determine the next step of treatment. Nathan, Tricia and Gwyneth will be returning home tomorrow from Duke. We all had hopes that this round of chemo would kill the cancer, but it hasn't. Thanks for your continued prayers. Charles Spurgeon, the great British preacher/pastor of the 19th century made the statement that every Monday he wanted to quit. This guy was far from a failure. He was the most celebrated and read Christian of his era. The church he led in London was by today's standards a "mega-church". Every week men and women came to faith under his ministry. But on Mondays he was down. That's a very common hazard that comes with the job. I know. I often feel it as well. A lot of spiritual energy is expended on Sundays. The "point man" often goes toe to toe in battle for the souls of men with the opposition. And then there's the devil to contend with, too! In my prayer time earlier God reminded me that it was Monday and prompted me to pray for a number of my pastor friends. Some are struggling today and I know it. Others I don't know, but still need encouragement to keep on. 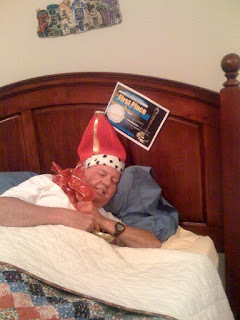 I think Burnie is too consumed with winning first place at Saturday night's chili cook-off. What do you think? Last night we had a Kick Off Rally coupled with a chili cook-off that was a lot of fun. In the rally we were challenged by Rick Warren, author of The Purpose Driven Life to seek God's purposes of fellowship, worship, discipleship, ministry and evangelism in our lives. What does God want from my life? Then tomorrow we actually begin Day One. 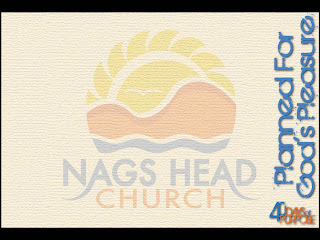 Nags Head Church first did 40 Days of Purpose 5 years ago, and it triggered a renewal in the life of our congregation that God used to launch us to greater things than we had ever seen before as a church. So we're looking forward to a second time; especially since in the last 5 years so many more have hooked up with us. God willing, this is going to be a great 6 weeks with eternal results. Today marks the 9 month anniversary of Gwyneth's birth. After a check up yesterday at Duke, she's doing great! In the picture she was 1lb. 6 oz. Today she's over ten pounds and what a joy! But Tricia is back in the very same ICU where she was on that day. Today, instead of being comatose, however, she is battling pneumonia. Thanks for your prayers for them. We know very well that prayers have covered the past nine months and will continue to make a difference. The song we sang Sunday, "Our God Reigns" - about His sovereignty - brings great comfort and hope. Today's weather was absolutely picture perfect. Carolina blue sky, gentle breeze and temps between 60 and 70. October is the best time of year on the Outer Banks! Burnie Staples, our pastor of missions, gave us a challenge this morning about what it means to be on the team. Using a couple of good sports analogies he reminded us that the name on the front of the jersey is more important than the name on the back. And then he applied 5 principles of teamwork to our strategy here at NHC. Great stuff, Burnie! If you missed it, look for it on our podcast page soon. 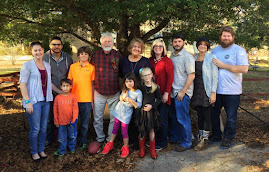 Our congregation is taking on more and more a local appearance as the out of town guests become fewer and fewer. It's this time of year that we ramp up the local ministry a bit more. 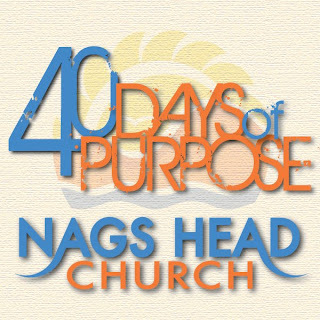 And this weekend kicks off the highlight of the fall as we get pumped for 40 Days of Purpose. Lots of donuts today! Lots of coffee and lots of brothers and sisters just spending time together before and after each gathering. The MP 13 Band, the video "This is not This" about our current financial insecurities, and Taylor Edmonds (who is going to Rome for 2-3 years as a missionary) asking for our prayers made it an awesome worship day. Then (and this really is icing on the cake) our pastors (and most of our wives) met for lunch with five who have requested to become partners with us at NHC. Thanks Hospitality Team for the lunch! And we look forward to welcoming our newest team mates soon! But to top it all off, the Redskins beat the Eagles. Dallas last week. Philadelphia today. It can't get much better! Right place, right time. You gotta love it. Why does it seem that leading politicians in our country can't pronounce the word "nuclear"? It's really not that hard. And it's a word that's still in vogue. Starts at 6:30 sharp! I can't wait.